Why does the CHI G2 Hairstyling Iron Work So Well at Straightening Short Hair? Does your short wavy or curly hair just not seem to cooperate when you go to straighten it? The problem could lie in the type of flat iron you are using on it. Maybe you are not aware that there are some flat irons in the beauty marketplace that work better than others on short hair? 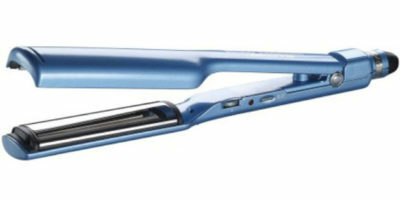 One of those we have been getting glowing reports on is the CHI G2 Ceramic and Titanium Hairstyling Iron. CHI is a huge name as far as hot hair styling tools go. That means we certainly want to take a good look at this flat iron to see if it can straighten short hair, as well as people, say it can. Slightly heavy at 1.4 lbs. There is a lot you can do with this CHI flat iron because of how well it works and how versatile it is too. You have your choice of three different temp settings (370°F, 395°F, 425°F) to start with so it will straighten every short hair type but those who have really fine hair. It also features a very neutral 1 ¼” heat plate width too. The heat plates are ceramic coated with titanium infusion so they heat quickly (under 60-seconds) and stay hot throughout your entire short hair straightening process. This is not the lightest flat iron at 1.4-pounds but its balanced well and has a nicely rounded edge design. That makes it ideal for adding waves and curls to your short hair too. The temperature display is not only digital but it’s color-coded too. Blue indicates a good temperature for more sensitive hair types, green is used for normal hair types and red indicates a temperature that is ideal for tougher to straighten thick or coarse hair. 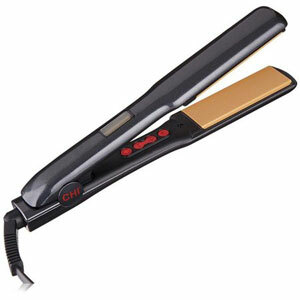 The CHI G2 Hairstyling Iron comes with a longer than normal 11-foot long power cord with swivel end. That allows for virtually unrestricted movement when using it. We mentioned that this CHI flat iron has versatile 1 ¼” width heat plates. That is a good size for any type of hair length including shorter hair. This plate size is wide enough to still allow you to straighten your short hair very quickly and efficiently too. Its ceramic coated and titanium infused heat plates are great to have when straightening short hair too. That is because the surface is so smooth you will hardly if ever catch your hair on the heat plates. This will help prevent damage to your hair and this ceramic coated/titanium infused plate combination will also leave your short hair frizz free and a little shinier after its straightened. The warranty you get with this CHI flat iron is very average. It has a somewhat industry standard 2-year warranty. Where it differs is the fact that you will also get a 45-day money back guarantee with it which is nice to have. 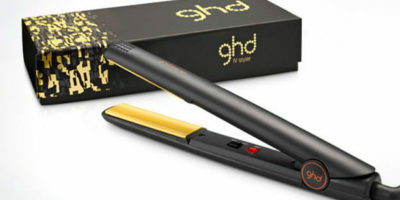 What don’t we like about the CHI G2 Hairstyling Iron? We don’t like the fact that it does not have a built-in auto-shutoff feature and we feel that at 1.4-pounds it can get heavy to hold after prolonged use. This is a highly recommended flat iron by those that have used it. Now we can see exactly why that is. It heats up fast, stays hot and has three versatile temperature settings. The ceramic coated and titanium infused heat plate design also will enhance your short hair straightening experience. Not to mention that its 1 ¼” heater plate size can handle most every length of short hair. Flat Irons that work as well on short hair as the CHI G2 Hairstyling Iron are very hard to find. It is definitely one you want to consider for purchase if you are looking for a new flat iron to use on your short hair.